Born 1956. Lives and works in Stockholm. As a conceptual visual artist he has, since 35 years, been working with performance art, light- and sound installations, film and photography. His "Red" series using red lights in various architectural misfittings has shown a rather critical side of his works. In Santa Fé an abandoned cemetery was litup in the nighttime by 20 000 watts (Red Night, 1999); in Liverpool the river Mersey was treated(Red Mersey, 2004) and in Chiangmai, Zagreb, Rijeka, Kaliningrad and Chicago abandoned housesaround the cities was lighted up and photographed (Red Empty, 2003-2010). His most recent redworks include Red Cochineal in Queretaro (Mexico), Red Dawnin Rominten (Russia) and RedEmpty in Haarlem (NL) and Sarajevo (BH). His interest in architecture and topography has also resulted in the films “Hashima, Japan 2002”, “AlQasr, Bahriyah Oasis, Egypt, 2005” and "Electra, Texas 2008" made in collaboration with film maker Thomas Nordanstad. Their latest film, Golden Days (Remedios 2012) was filmed in Colombia and premiered 2013 in Bogotá. In 1997 he launched a series of works under the title "Operations of Spirit Communication". This work, inspired by Electronic Voice Phenomena (EVP) techniques, was combining and merging sound and vision using analogue and digital technologies such as oscilloscopes, radars and sonars. These ready-made machines were showing the possibilities of ghosts and other kinds of life forms living inside a certain space or inside the electricity grids. The cities of Paris, Linz, Bangkok, Shanghai, Banja Luka, Berlin, Kuala Lumpur, New York City, Tokyo, Frankfurt am Main, Stockholm and Copenhagen has been under this magnifying ghost glass. The exhibition “The Complete Operations of Spirit Communication” was shown at OK Centrum in Linz, Austria. Hausswolff has also collaborated with EVP researcher Michael Esposito in several sessions - a vax cylinder was released in 2010 out of that work. Recently he has also investigated prime energies in solid matter - works that have echoed in the international press. His interest in audio and radio technology also came in light at the 49th Biennale di Venezia in 2001. In a collaborative work with Tommi Grönlund, Petteri Nisunen, Leif Elggren and Anders Tomrén hehad constructed a radio receiver that could play all radio transmissions from the Venice area at the same time. The entire Nordic Pavilion was filled with this mix of sounds producing a beautiful and at the same time profound religious audio graphic environment. Other radio tech works include the usage of scanners and EVP frequencies. Hausswolf has also created a series of social platforms, places where people can meet and consume. His “Thinner- and Low Frequency Bar” was used at the Momentum biennial in Moss, Norway, Prato, Italy and London and his “Glue- (Tobacco-) and High Frequency Lounge” was used in Geneva and in Prato. These works show Hausswolff’s critical view on the society’s hypocritical treatment of drugs and addiction. The audience could sniff the highly toxic substances thinner an contact glue while smoking cigarettes and getting penetrated by the either low or high sine wave tones. The latest bar work was installed in Cairo 2010 (Darb Center) and Stockholm 2012 (Moderna Museet): The Cobra Venom Bar. In 1993 he and Leif Elggren developed the ever-lasting conceptual piece “The Kingdoms of Elgaland-Vargaland”. Here a new country was established in the world. Its territories was all border areas between every country, the No Man Land, mental territories such as the hypnagogue dream state and digital areas on the Internet. Paraphernalia such as a constitution including flags, coat of arms, and national hymn was produced and letters was sent to every government in the world asking for recognition. In 1995 an application for membership in the United Nations was sent in and in 2005 the New United Nations was proclaimed. Elgaland-Vargaland now has over 900 citizens and is frequently manifesting itself through the channels of conceptual art. Embassies has been established in Stockholm, Mexico City, Oujda, London, New York, San Francisco, Zürich, Barcelona, Helsinki and many other places. In 1995 the country annexed Schlaraffenland and at the 50 Biennale di Venezia in 2003 the state annexed Thomas More’s Utopia at the Utopia Station project. A new embassy was inaugurated at the Haus der Kulturen der Welt in Berlin and the Island of The Dead (Isola di San Michele) in Venice was annexed June 10, 2007; Bodensee was annexed in 2008 organized by Cabaret Voltaire in Zürich; the royal Privvy was installed in 2012. The KREV embassy in Oslo was inaugurated in August 2013 and in Marrakech in 2014. 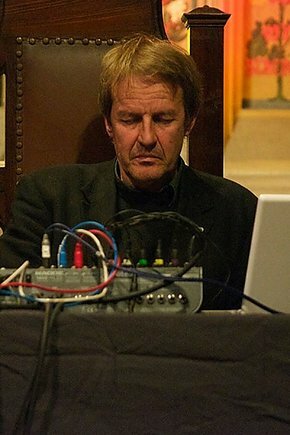 Since the end of the 70s, Hausswolf has worked as a composer using sound recorders and sinewaves as his main instruments. His concerts are often dynamic constructions using the acoustics in a specific space. His records has a conceptual and intellectual foundation where the composed sounds oscillates between sounding object and music. Hausswolff's music has been performed throughout Europe and in North America and Asia in festivals such as Sonar, Electrograph, Cut&Splice and Sonic Acts. His compositions can be found released by labels such as Laton, SubRosa, iDeal, RasterNoton and Touch. Hausswolff's music is published by Touch, London.Musically he has collaborated with Jean-Louis Huhta and Graham Lewis (Wire), Pan sonic, Russell Haswell, Leslie Winer, Hans-Joachim Roedelius and others. He is currently working on a series of compositions with Jim O’Rourke. Hausswolff was a freelance curator at Färgfabriken Centre for Contemporary Art and Architecture inStockholm. From 1999 until 2008 he curated retrospective exhibitions by the works of the EVP pioneer Friedrich Jürgenson, his long time colleague Leif Elggren, and Swedish electronic music pioneer Rune Lindblad. He also curated a special exhibition of works by his mentor Brion Gysin as well as works by Max Fredriksson, Henrik Rylander and Henrik Andersson. He has later “artistified” Jürgenson, as well as Swedish mail bomb inventor Martin Ekenberg and has introduced other "artists" such as US astronaut James Irwin, the Norweigian spy Selmer Nilsen, the Japanese soldier Hiroo Onoda, the gangster Lucky Luciano and others into the field of contemporary art. A major exhibition of these works were shown at Lunds Konsthall in 2013. During the 1980s he was co-founder of the culture organisation Radium 226.05 releasing records with music by Sten Hanson, Rune Lindblad, Union Carbide Productions, PHAUSS and other Swedish artists and in the 1990s he launched the record label Anckarström releasing music by The Hafler Trio, John Duncan, Adi Newton, If Bwana, Stelarc, Dror Feiler, Zbigniew Karkowski and others. In 2003 Hausswolff curated Against All Evens - the 2nd International Biennial for Contemporary Art in Göteborg, Sweden. Here he mixed sound artists like Ryoji Ikeda, Else Marie Pade and John Duncan with dictator painters from Libya and Cambodia; contemporary artists like Phill Niblock, Simone Kaern-Aaberg and Surasi Kusolwong with ready-made artists like Friedrich Jürgenson and Martin Ekenberg; painters like Jan Håfström with painters like Kim Gordon and Russell Haswell. IN 2003-16 he curated the sound art project “freq_out”, in Copenhagen, Oslo, Paris, Berlin, Chiangmai, Budapest, Kortrijk, Stockholm and Amsterdam. This project includes the individual works from 12 sound artists shown in a collective way. The frequency range from 15 – 12 000 Hz was divided up into 12 sections and handed out to the artists. These exhibitions has showed a new way to deal and treat sound works as an exhibitional form, a form that mostly has been chaotic and non functional in many recent group shows. Artists included are Jacob Kirkegaard, J.G. Thirlwell, Jana Winderen, Christine Ödlund, BJNilsen, Finnbogi Petursson and Pomassl. freq_out 8 was installed at Moderna Museet in Stockholm 2012 and freq_out 9 at Stedelijk Museum in Amsterdam 2013. freq_out 10 was installed in conjunction with the 5th Marrakech biennial in 2014 and in 2016 freq_out 12 was installed in the famous sewers in Vienna (where The Third Man was filmed in 1946) organised by Thyssen Bornemisza Art Contemporary.